Our signature house gift box has a festive motif for the holidays. 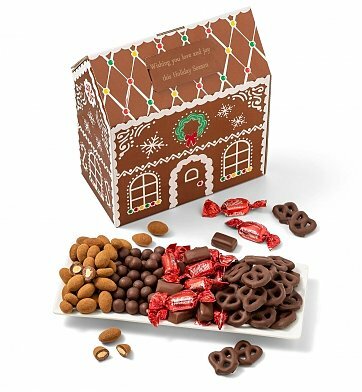 Exclusively designed to look just like a gingerbread house, it arrives filled with delicious chocolates, nuts and more. It's an exciting holiday gift for colleagues, clients, employees and even friends or family, especially with your personalization on the roof! Chocolate Pomegranate Truffle Cremes, Cinnamon Almonds. Chocolate Covered Pretzels, Bourbon Chocolate Caramels. Personalize it! Your chosen name, date or special message can be printed on the designated space on the home's roof. Up to 4 lines, 23 characters each. Complete the personalization option during the checkout process. Festive Chocolate and Nuts Gingerbread House is a hand delivered gift. These gifts are delivered by one of our local design centers located throughout the United States and Canada. Same day delivery is available for most gifts when ordered before the cutoff time. The cutoff time for Festive Chocolate and Nuts Gingerbread House is in the recipient's time zone.